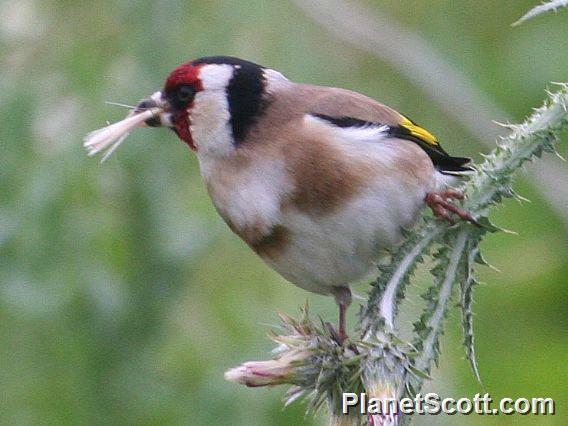 Thanks to their long, pointed beaks, male goldfinches are the only birds that are able to extract seeds from teasel heads; they cling to the stem and tear into the seed head, accessing the seeds inside by probing with the bill (5). Females have shorter beaks and so they are unable to exploit teasel heads (5). In the autumn, when seed heads are common, goldfinches have a broad diet, feeding on groundsels, ragworts and dandelions as well as the favourite teasels and knapweeds (5). Outside of the breeding season, goldfinches roam in flocks in search of food during the day (2). At night they roost in evergreens or thick scrub. Flock size varies depending on the availability of food, but groups of 100 birds are quite common (5). During spring goldfinches often display whilst sitting on branches, singing, drooping the wings and swaying from side to side (6). Between four and six eggs are produced and these take up to 14 days to incubate. The young goldfinches will have fledged after 13-18 days (3).